Bangalore, January 25, 2018: Doctors at Fortis Hospital, Bannerghatta Road successfully performed a rare bilateral knee replacement surgery on a 47-years-old man suffering from Hemophilia here recently. The resident from Bangalore was suffering from severe pain in both his knees impairing his ability to perform daily work. His severe condition of Hemophilia, a genetic disorder that leads to profuse and unstoppable bleeding along with poor blood clotting following any injury, made this bilateral knee replacement a unique feat of clinical excellence. 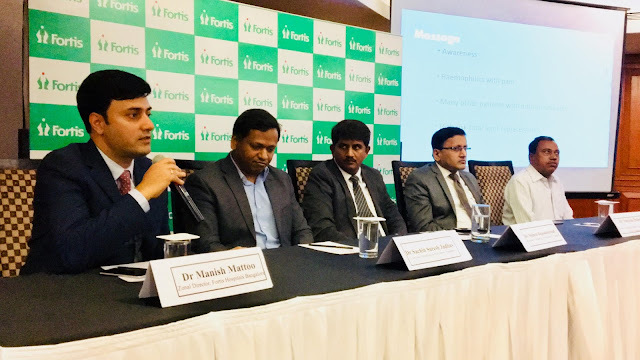 The team of doctors were led by Dr Narayan Hulse, Additional Director, Orthopaedics along with Dr Sachin Suresh Jadhav, Consultant, Hematology and Bone Marrow Transplant at Fortis Hospitals, Bannerghatta Road in Bangalore. Earlier, the patient was admitted with complaints of severe pain, difficulty in bending knees affecting his walking capability and perform daily chores. After evaluating and trying various medications, bilateral knee replacement was the only treatment to cure him of this lingering pain in his knees. However, the hemophilia condition made this a rare and challenging case. Hemophilia is a genetic bleeding disorder in which the blood does not clot properly risking the life of a hemophilia patient following injuries or surgery. Due to this condition, the patient was prone to multiple joint bleeds or hemarthrosis since birth. These may be caused by minimal trauma and affects primarily joints like knees, ankles and elbows. With recurrent hemarthrosis of knees, it caused joint degeneration or hemophiliac arthropathy. With the help of some excellent treatment plan of recovery by the doctors, the condition of hemophilia was impeccably managed and the knee replacement was done without any complications. The clinical excellence of the case was proved when the patient recovered completely. There are about 17000 hemophilia patients in India out of which 2500 are in Karnataka. Factor VIII medication is used to control and prevent bleeding episodes in people with low levels of factor VIII (hemophilia A). It is also used in these patients before surgery to prevent bleeding.The product contains human factor VIII, also called antihemophilic factor. In this patient's case, factor VIII injection was funded by the government. According to the World Federation of Hemophilia (WFH), India has the second highest number of global patients with hemophilia A where most of the patients remain undiagnosed. This calls for more education and surveillance to the mass for prevention and care of this disease.